“Awning and casement windows can be mistaken for one another as they are similar in structure and are both considered crank windows that are equipped with a user-friendly fold-down handle, however, there is one key difference between them,” said Lance Dahl, CR, Senior Sales Representative of Exterior Products with Callen Construction. 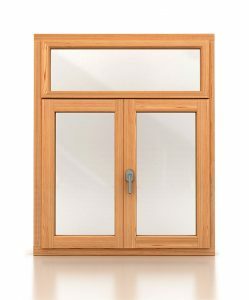 “The placement of the hinge determines if the window is classified as an awning or a casement window.” The hinge on an awning window is located at the top, meaning the window opens outward from the bottom, while the hinges on casement windows are located on the sides, meaning the windows open outward to the left or right. Due to the location of the hinge on an awning window, the width should surpass the height in terms of the dimensions of the opening for the window. Awning windows are especially useful when placed in rooms that call for added ventilation and natural light. Therefore, the area above the kitchen sink or in a bathroom are both prime locations for this type of window. Often times, awning windows are complimented with stationary windows. “This paring helps to frame a beautiful view since both awning and stationary windows are absent of any rails or bars,” said Lance. Moreover, awning windows prevent precipitation from entering the home, which means you can safely appreciate a cool breeze during a rainstorm. 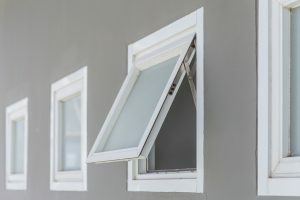 “Keep in mind that awning windows need ample clearance on the outside in order for them to fully open, so be sure to place them in areas that are void of nearby bushes, trees, or other barriers,” Lance said. When the windows are closed, they are highly energy efficient, which plays a pivotal role in maintaining a comfortable indoor temperature year-round. “Casement windows, on the other hand, have hinges on their sides, which requires the height to exceed the width in relation to the dimensions of the window’s opening,” he said. Similar to awning windows, casement windows provide increased air ventilation, substantial natural light, and a clear view. Consequently, they are most popular in living rooms and dining rooms. They can also be found in kitchens and sometimes bedrooms. Both awning and casement windows offer ease of use, superior ventilation, excellent energy efficiency, an unimpeded view of the great outdoors, and a plethora of natural light. With the main difference between these two types of windows being the location of the hinge, the most difficult decision you are faced with is which style you prefer.